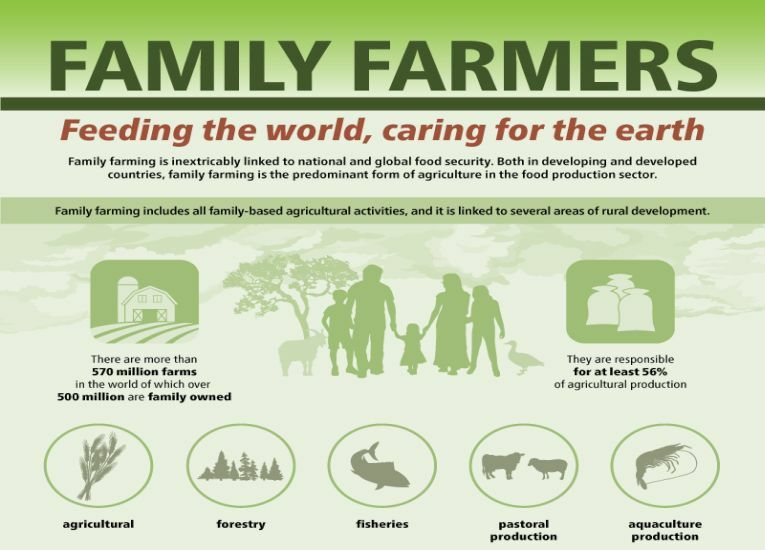 The 2014 World Food Day theme – Family Farming: “Feeding the world, caring for the earth” – has been chosen to raise the profile of family farming and smallholder farmers. It focuses world attention on the significant role of family farming in eradicating hunger and poverty, providing food security and nutrition, improving livelihoods, managing natural resources, protecting the environment, and achieving sustainable development, in particular in rural areas. Family farming is inextricably linked to national and global food security. Both in developing and developed countries, family farming is the predominant form of agriculture in the food production sector. Family farming includes all family-based agricultural activities, and it is linked to several areas of rural development. World cereal production in 2014 is anticipated to reach 2523 million tonnes, some 65 million tonnes higher than FAO’s initial forecast published in the May issue of this report. A continued upgrading of this year’s coarse grain harvests, maize in particular, has been the main underlying factor. Under current expectations, world cereal production would fractionally decline from the 2013 peak; with wheat production achieving a new record, at 718.5 million tonnes, and coarse grains virtually matching last year’s high of 1308 million tonnes. By contrast, unfavourable weather conditions have lowered prospects for rice production, which is now forecast to reach 496.4 million tonnes, down 0.4 percent from 2013. 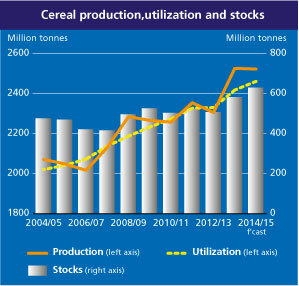 Global cereal utilization in 2014/15 is set to increase by 1.8 percent from 2013/14. Total food use is expected to rise by just over 1 percent, implying a stable per capita basis of 153kg per annum. Feed use, on the other hand, is likely to expand by 2.5 percent, a much slower pace than in 2013/14. Based on the latest forecasts for production and utilization, world cereal stocks at the close of crop seasons ending in 2015 would surge to 627.5 million tonnes, up 8.3 percent from an already large volume at the start of the season and its highest level in 15 years. Maize would account for the biggest increase, followed by wheat, while rice stocks are forecast to decline, albeit from a record level. The overall positive outlook, if realized, will result in the cereal stocks-to-use ratio increasing to 25.2 percent in 2014/15 from 23.5 percent in 2013/14, and the highest since 2001/02. This year’s abundant supplies have already resulted in sharp declines in international prices of all cereals, with the exception of rice. However, the lower prices are not expected to stimulate trade, as the major cereal importing countries are holding large supplies, which may depress import demand and result in total cereal trade contracting by 5.0 percent to 337 million tonnes in 2014/15. For more detailed analysis see the October 2014 issue of Food Outlook released on 9 October.